D24 is 28 days old today, while D25 turns 26 days old. At this point, feather growth is starting to overtake structural growth as the eaglets approach the half-way point in the nest. Pinfeathers emerged this week, growing at an astonishing rate as they poked out from their keratin sheaths along the edge of the eaglets' wings. 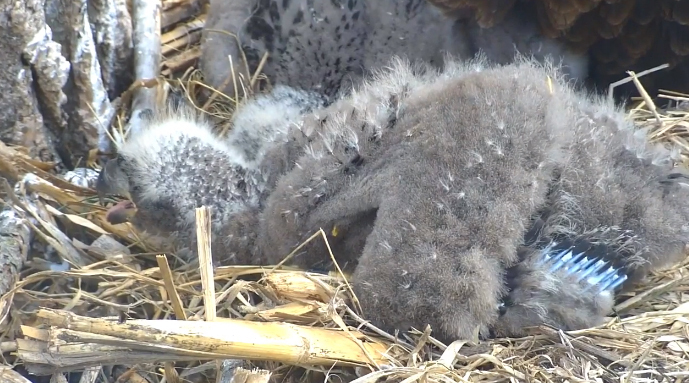 Feathers also started to emerge along their backs - the 'cloak' - and sprout from their tails. 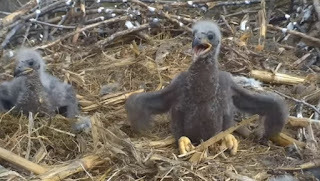 As beak, leg, and footpad growth began to slow, wing growth sped up, leaving the eaglets with noticeably longer, larger wings by the end of week four. We also saw changes in behavior. 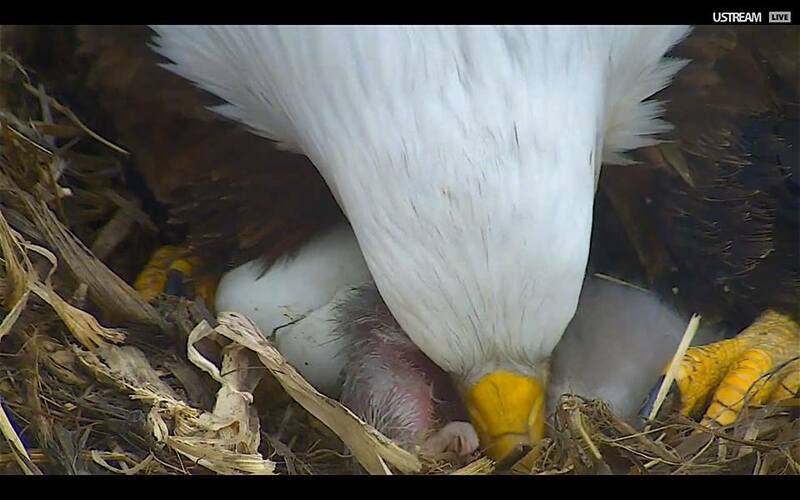 Although the eaglets will continue to compete for food, baby bonking has ceased. This always makes me wonder what functions it serves. We know it strengthens muscles, aids coordination, and helps improve eyesight. 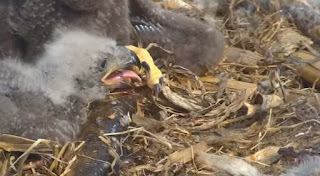 Does food competition lead to greater food intake, helping to fuel an eaglet's rapid growth? Does it lay the ground for future social interaction, which includes plenty of body language, vocalization, and dominant/submissive interaction? 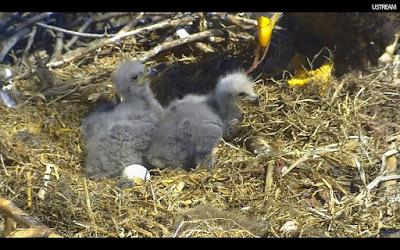 Does it give parents information about an eaglet's overall heath, or help prompt provisioning? Or is it simply replaced by a new suite of physical behaviors as the eaglets begin to explore the nest and enter the next phase of nestling life? Bonking may have ended, but the eaglets are starting to play with sticks, move towards a full stand, and expand their explorations of the nest. They've also begun noticing the area around the nest, tracking with Mom and Dad as the adults pay attention to the outside world. So what can we expect to see in week five? Watch for an explosion of dark feathers, leading to an evenly mottled grey and white appearance some time in the next week. The eaglets will begin standing and walking, leading to many mouse clicks as we try to shoo them back to the center of the nest! We may see them begin to tear their own food and we will get to see them 'play house' as they begin moving sticks around themselves and with Mom and Dad. If past years are any judge, Mom and Dad will give them plenty of materials to work with as they pile up the crib rails with larger, heavier sticks! We've talked a lot about physical changes. 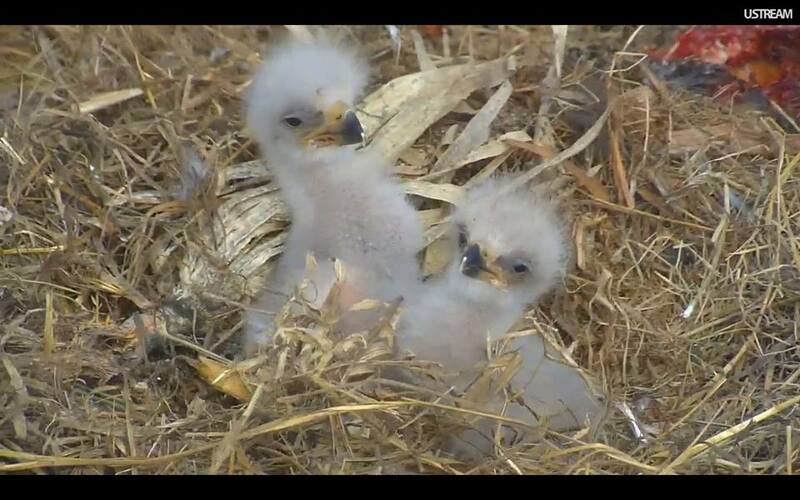 We are also entering a period of rapid developmental changes as the eaglets acquire new skills and grow feathers. The eaglets will play cooperatively and competitively, learn to stand, walk, and tear food, and begin moving their wings. Following the appearance of Mom's teakettle whistle, I'm waiting for baby vocalizations to turn into juvenile screes for food! I'm looking forward to watching D24 and D25 move into the next phase of their lives as feather growth takes over from body growth and greater mobility leads to changes in behavior. So where is our cortical homunculus in weeks 4-5? I'd tend to think that legs, feet, and wings are accelerating in importance this week, leading important behaviors like standing, tearing, and flapping! I also wonder what impressions are being made now that they are beginning to pay attention to the outside world and have moved from playing with grass to nibbling at larger, heavier sticks. The nest and eagles always have more to teach us! This week is National Volunteer Appreciation Week! I wanted to take the time to thank all of our wonderful volunteers for everything they do for us! Our Chat and Facebook Mods dedicate an extraordinary amount of time to providing a fun, educational chat. In addition to time spent online with watchers, they dedicate themselves to learning everything they can about bald eagles and their habitat, help keep me informed of important or extraordinary events, let me know when technology is going wrong, and bring their own ideas to bear on tools and content for followers! Our sites would not be what they are without them. Our Camera Operators and Video Makers share life in the nests with us. They give us extraordinary close-ups, interesting moments, and tours of the areas that shape the lives of the birds we watch. Thanks to them, we get to see and relive important events and cuteness overload close-ups, even when we aren't able to watch live! Our Landowners share their wildlife and resources with us. We would not be watching eagles if they weren't willing to let us do so. Those with falcons on their properties watch nests, provide helpful information, and let us on to their land to band, survey, and put up boxes. They have been a critical part of peregrine falcon recovery! Our Board is working on long-term goals and strategies. We would not have N2B or Decorah North without their direct help, and it has been wonderful to work with them as we do things now and prepare for our future. Volunteers, I appreciate their dedication and talents more than I can say. As Bob would say "You ROCK!" Thank you for all you do. D24 is 15 days old today, while D25 turns 13 days old. The week-old difference between these two photos is striking. In their second week of development, the eaglets grew larger, gaining roughly two pounds between April 4th and April 12th. They experienced rapid growth in features like beaks, culmens, and footpads, replaced their white natal down with thicker grey thermal down, and began exploring the nest. Although they aren't yet standing on their toes, they are able to sit up - way up! - for feeding and shuffle around on their metatarsi. Their eyes are wide open and fit more comfortably in their eyesockets, features like brow ridges are beginning to appear, and their legs and footpads are yellow, not pink. Gary Bortolotti wrote that bald eagles might gain more weight per day than any other north American bird, although the majority of their weight gain occurs within the first 30-40 days. This rapid weight growth is fueled by their nutrient-rich diet of meat. Over the past week or so, we watched the eaglets chow down on fish, roe (fish eggs), venison (aborted fetal deer), rabbit, squirrel, something that might have been a muskrat, waterfowl, and several other birds. D24 became proficient enough at shooting poop to christen the Poopcasso tree on April 5th, while both eaglets got in plenty of tussling and bonking play, alternately hitting, submitting, and quitting to cuddle in the nest cup, grow, and wait for more food to arrive. 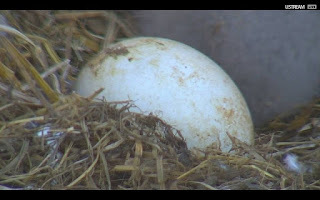 Watchers have been asking why the Fort St. Vrain eaglets began wandering the nest so much earlier than the Decorah eaglets. While we don't know for sure, we suspect that temperature played an important role. Fort St. Vrain experienced unusually warm temperatures in late March and early April, and the leaves hadn't unfurled to provide shade for the nest. Cold is a challenge to eaglets under 10-15 days of age, but so is heat! With little ability to control body temperature and no way to lose heat except by panting, the eaglets did their best to retire to what little shade tree limbs and the nest itself offered. Once in the shade, they sprawled out as much as they could. Mom did her best to provide shade for the eaglets, moving from one to another and standing between them and the sun. As alarming as it was to viewers, Mom's ploy worked and we didn't see quite as much wandering, at least for a few days, after the weather cooled down. In the week to come, we can expect (continued) rapid growth in footpads, talons, and legs. Beak growth will rapidly slow as the eaglets' beaks approach adult size and we may see dark juvenile feathers start to sprout from their grey down. Overall weight and height gain will continue, most likely reaching their steepest curves some time this week. By the end of the week, our little bobbleheads at Decorah and Fort St. Vrain will be almost a foot tall, while the eggs at Decorah North should begin hatching! 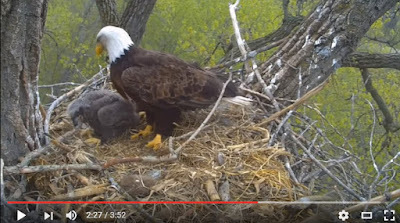 Watchers have observed that different nests seem to have different 'parenting' styles: i.e., Dad may be more present at one nest than another, food may come in more or less regularly, and eaglets might spend more time alone. Many things influence nest life, including weather, temperature, food availability, predators, and the presence of other adult, sub-adult, and juvenile bald eagles. 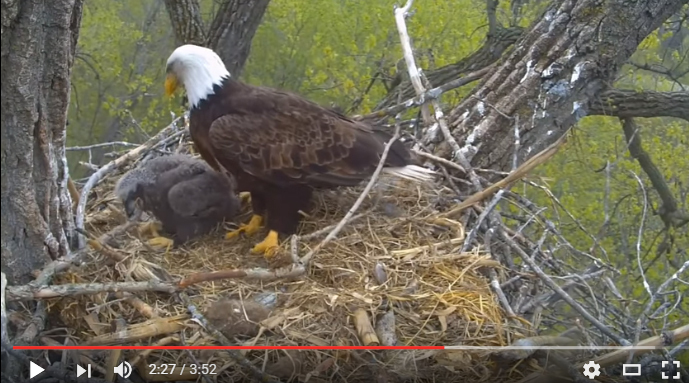 While eaglet growth and development occurs along a fairly predictable trajectory, local conditions can change the timing of events - something we've seen in Decorah, Fort St. Vrain, and the year we watched Eagle Valley. We are looking forward to hatch at Decorah North! I'm not sure how familiar many of you are with the cortical homunculus, an image-based tool that maps tactility. We discussed it very briefly in this blog and I'll include links below. While useful and extremely cool, most cortical homunculii are static - that is, they reflect just one phase (usually adult) of an organism's life. But an eaglet's cortical homunculus will differ from an adult's as body parts and associated skills are gained and neural pathways developed. Our eaglets' brains and bodies are rapidly growing and changing as they gain the skills they need for life outside the egg! I'd tend to think that visual acuity suddenly 'lit up' this week, leading changes in coordination as the eaglets began sitting up and moving around. D24 is three days old today, sibling D25 is not quite a day old as I write, and D26 is still inside the egg. What can we expect in the first week of watching?